The scuba diving in Vanuatu is superb and offers reef and wreck dives for novice and experienced divers. Vanuatu is, of course, home to one of the world's most sought after dive sites, The President Coolidge. The 'Coolidge' is off the island of Espiritu Santo and, as it is recommended only for the experienced divers who have several days to explore and then wait before flying out. There are many dive sights within half an hour of Port Vila and a number of quality dive operators. Twin Bombies - There are two 'bombora' formations and a sheer wall on this dive. The grottos and coral are alive with a variety of welcoming fish. 10 metres on top of the reef to 18 metres over the drop-off. Fila Island Reef - Just 15 minutes from the dive base with a depth of 6 to 15 metres. Lots of colourful coral and a variety of colourful small fish. Lacksands Reef and Caves - 8 - 14 metres with a variety of fish and rays on the sandy bottom. 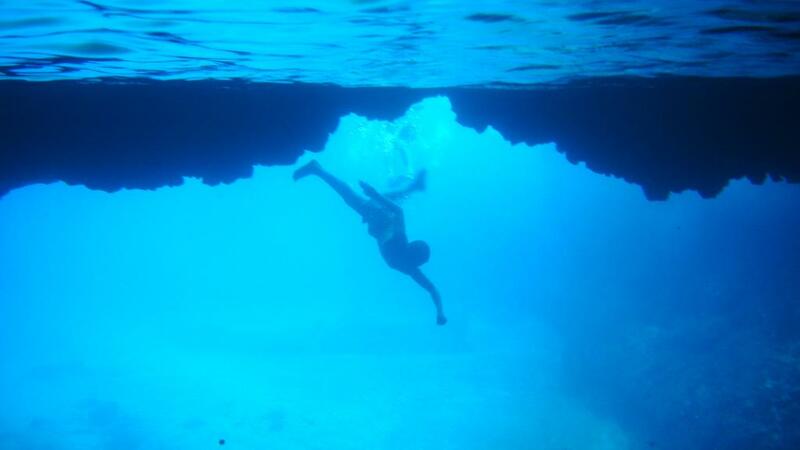 There is a series of interlocking caves and swim-through tunnels honeycombing this reef. Mele Reef - An extensive reef that rises up in the middle of Mele Bay to around 6 metres from the surface. There are lots of dives around here - a good one is along a vertical wall to a shallow reef to finish. Cathedral - A delightful dive in a vast cavern off the Pango peninsula to 26 metres. Shafts of light create unusual effects. You can swim through to the back and up a 'chimney' to a large pool on the surface inside the reef - then back to the outside and along the wall to explore and look out into the deep open ocean. Ollies Lolly - Near Hideaway Island this is a large bommie starting at 9 metres. A range of hard and soft corals and heaps of fish - large and small. Great for photography. Konanda - This is a lovely wreck dive. Konanda sits on a flat, sandy bottom at 26 metres with her derricks and rigging reaching up to within ten metres of the surface. She is an Island Trader, 45 metres long, which was damaged in a cyclone in 1987 and deliberately sunk for the delight of scuba divers. She has been carefully prepared so penetration into the cabins and holds is totally safe. An ideal introduction to the fun of wreck diving. Star of Russia - This grand old lady of sailing ship days rests in Port Vila Harbour. She's 80 metres long and 13 metres wide and down 33 metres. Divers can swim through the body of the ship, swim up the three massive masts, around the romantic, shapely bow and check out the wheel, rudder and anchor machinery. There's some history here too. The Star of Russia was built by Harlan and Wolff of Belfast who also built the Titanic. It was also part of a race between herself and one of the new steamships in the early 1900's. The race was from England to Australia. They took different routes (as 'Russia' was subject to the prevailing winds) and the sailboat took the honours with the steamship three days behind! Semle Federsen - A cargo-carrying trading vessel which was sunk along the Pango Coast in Mele Bay in 1985. Now home to lots of plants and animals, the stern area, cabins and wheelhouse can be dived within 40 metres. The visibility here is outstanding (60 metres) and the whole ship can be seen at a glance while descending the mooring line. A valuable dive as a build-up for divers wanting to take on the 'President Coolidge' in Santo. Tukutuku Caverns - Tukutuku Caverns is across the bay from Pangona, 25 minutes by boat from Vaughani Shores. It has so many caverns that it would take 2-3 dives to see them all. The entrances are wide, and the caverns are well-lit. Outside the caverns are steep walls, mainly decorated as shelves of table corals that jut out from the sides. Several caverns are circular, meaning you enter into one and come out through another. In between there are swim-throughs lined with lace corals, appropriate for all skill levels. The caverns are particularly inviting for a night dive, as one never knows what other white-tipped guests might be inside.